McNary head coach Ryan Kirch has challenged his team’s competitiveness and toughness since the Celtics opened the season in late November. 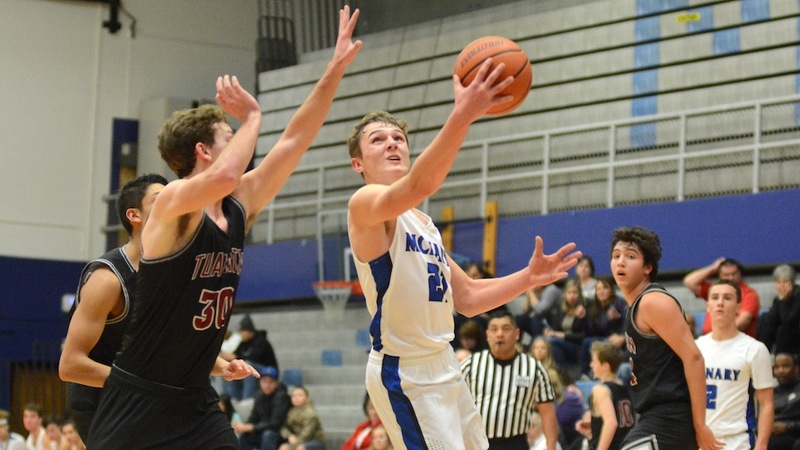 Down five points at halftime, that competitiveness, toughness and execution all came together as McNary topped previously unbeaten Tualatin 72-58 on Wednesday, Dec. 27. The Celtics jumped out to an 18-11 lead against Tualatin, who entered the game 8-0 and No. 2 in the 6A OSAA Power Rankings. But the Timberwolves made three 3-pointers in the second quarter to take a 34-29 lead into halftime. Running Tualatin off the 3-point arc was something McNary had talked about before the game. The Timberwolves made just one 3-pointer in the second half. Jones scored 11 of his 13 points in the second half, including a 3-pointer to give the Celtics a 43-42 lead with 2:49 remaining in the third quarter. Jones scored four more points at the beginning of the fourth period to stretch McNary’s lead to 54-48 with 5:47 remaining. “Andrew last year was really frustrated and rightfully so, he didn’t play a lot,” Kirch said. “Sometimes you can handle that a couple of ways, you can pout, you can complain or you can keep your mouth shut. I know he was frustrated with me and I get that as a competitor. He spent a lot of time in the weight room and a lot of time just wanting to be good and enjoy his senior year. Every time I’m in the gym, I see him in the gym. Coach (Jordan) Graneto mentioned it at the end of the game how much he controlled the game in the second half and that’s important for us. Garvey scored 10 of his team leading 21 points in the fourth quarter as McNary grew its advantage to as many as 15 points. Garvey made only one 3-pointer, scoring most of his points in the paint. Garvey also guarded Tualatin’s best player, senior Alexis Angeles, last year’s Three Rivers League Player of the Year, limiting him to 18 points. Cavell had 15 points in the victory. Riccardo Gardelli and Boston Smith each added eight points. The Celtics plays at Sheldon on Friday, Dec. 29 at 7 p.m. McNary then returns to league play on Tuesday, Jan. 2 at Forest Grove at 6:45 p.m.